The accurate, reproducible, and timely reporting of nucleated red blood cells (NRBC) is an important function of the clinical hematology laboratory. The number of RBC in a known volume of diluted blood is counted and the number of cells in one cmm of undiluted blood is calculated from this. This is formed by the action of a chemical called cyanide (for example. Potassium cyanide, KCN). The combination is reversible. Hemiglobincyanide is the methemoglobin bonded to cyanide ions. To measure accurately the total Hb in the blood, it is essential to prepare a stable derivative that will contain all the a Hb forms (complexes) that are present in the blood. All forms of circulating hemoglobin are readily converted to hemoglobin-cyanide (cyanmethemoglobin), except for sulfhemoglobin which is normally not present in the blood. Therefore, the cyanmethemoglobin method is the most accurate method for the determination of hemoglobin. In this method monocytes isolated by ficoll method,further The Monocyte Attachment Medium(DMEM) allows for the efficient adherence selection of monocytes from freshly isolated human mononuclear cells while maintaining optimal cell health. 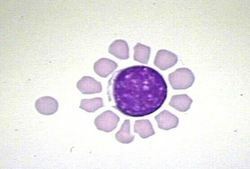 Erythrocyte rosetting or E-rosetting is a phenomenon seen through a microscope where red blood cells (erythrocytes) are arranged around a central cell to form a cluster that looks like a flower. The red blood cells surrounding the cell form the petal, while the central cell forms the stigma of the flower shape. This formation occurs due to an immunological reaction between an epitope on the central cells surface and a receptor or antibody on a red blood cell. The presence of E-rosetting can be used as a test for T cells although more modern tests such as Immunohistochemistry are available. May be caused by Plasmodium in malaria. Rheumatoid arthritis is a disease that affects the joints. It causes pain, swelling, and stiffness. If one knee or hand has rheumatoid arthritis, usually the other does too. This disease often occurs in more than one joint and can affect any joint in the body. People with this disease may feel sick and tired, and they sometimes get fevers. The aminotransferases catalyze the chemical reactions involving the amino acids, where an amino group is transferred from the donor amino acid to the recipient molecule. Aminotransferases are also referred to as transaminases. Another name for AST is serum glutamic oxaloacetic transaminase (SGOT). The aminotransferases catalyze the chemical reactions involving the amino acids, where an amino group is transferred from the donor amino acid to the recipient molecule. Aminotransferases are also referred to as transaminases. Another name for ALT is serum glutamic pyruvic transaminase (SGPT). Test is based on the heamagglutination reaction. Human RBCs possessing A or B antigen will agglutinate with the corresponding anti-body. Agglutination of RBCs with Anti-A monoclonal, Anti-B monoclonal or Anti-A, B monoclonal is a positive test result and indicates the presence of the corresponding Antigen. Absence of agglutination of RBCs with Anti-A monoclonal, Anti-B monoclonal or Anti-AB monoclonal is a negative test result and indicates the absence of the corresponding antigen. Anti-B is especially useful in detecting the weak variance of A and B which are occasionally missed by the routinely used monoclonal Anti-A and Anti-B Anti-sera. Complement fixation referred as the binding and activation of complement to Ag-Ab complex. Normally complements bind to Ag-Ab complex, i.e. antigen-antibody reactions lead to immune complex formation which produces complement fixation via the classical pathway and this may be exploited to determine the amount of antigen or antibody present. Complement fixation can detect antibody level of less than one microgram per ml. CRP latex test is based on principle of agglutination. When latex reagent (polystyrene Latex particles coated with anti CRP) is mixed with a test serum containing antibodies to CRP higher than 0.8mg/dl gives visible agglutination reaction. If the concentration of CRP is lesser than 0.8mg/dl, no agglutination will be observed. Enteric fever occurs when pathogenic microorganisms like S. typhi, S. paratyphi A, S. paratyphi B infect the human body. During the courseof disease, the body responds to this antigenic stimulus by producing antibodies whose titre rises slowly in early stages, to a maxima and thenslowly falls till it is undetectable. Antibodies to salmonella organisms may be detected in the patient serum from the second week after onset of infection. Information regarding the titres and whether or not they are rising or falling can be obtained by performing serological tests using widal antigen suspensions. Usually tube titres of 1:80 and above are taken as diagnostically significant, however for endemic areas higher cut-offs may need to be established . The important components in blood are red cells, white cells, platelets and plasma.Red cells are relatively large microscopic cells withoutnuclei and transport oxygen from the lungs to all of the living tissues of the body and carry away carbon dioxide. The red cells are producedcontinuously in our bone marrow from stem cells at a rate of about 2-3 million cells per second. White cells, or leukocytes occur elsewhere inthe body as well, most notably in the spleen, liver, and lymph glands. Platelets or thrombocytes are cell fragments without nuclei that workwith blood clotting chemicals at the site of wounds. They do this by adhering to the walls of blood vessels, thereby plugging the rupture in the vascular wall. They also can release coagulating chemicals which cause clots to form in the blood that can plug up narrowed blood vessels.Plasma is the relatively clear, yellow tinted water (92+%), sugar, fat, protein and salt solution which carries the red cells, white cells, and platelets. Employing a mixture of Ficoll one can obtain gradients of specified density and osmolarity suited to the separation of cell types based on buoyant density. The specific density of the gradient that is needed for successful cell separation depends on the species. Human peripheral blood can be purified from diluted whole blood using Ficoll Medium. Negative staining is an established method, often used in diagnostic microscopy, for contrasting a thin specimen with an optically opaque fluid. In this technique, the background is stained, leaving the actual specimen untouched, and thus visible. This contrast with 'positive staining', in which the actual specimen is stained. Negative stains are even simpler than simple stains because you do not have to make a smear. A drop of cells is spread on a slide and viewed without fixation. The stain is a suspension of carbon, found in India ink or nigrosin. The carbon particles are negatively-charged, as is the cell membrane. The background looks black or sepia colored and the cells remain clear, since they repel the dye. Some positively charged inclusion bodies such as sulfur may stain. This stain gives accurate information on cell morphology and capsule presence because the cells are not fixed. Albert's staining technique is a type of special staining technique since it is used to demonstrate a special structure in bacteria. It is chiefly used to demonstrate metachromatic granules found in Corynebacterium diphtheriae. The storage granules in this bacterium is called metachromatic granules because it exhibits the property of metachromasia, wherein the granules appear in a colour other than the colour used for staining. When stained with polychrome methylene blue, the granules appear violet while the rest of the bacillus appears blue. Green coloured, rod shaped bacteria that are arranged at angles to each other resembling English letter 'L', 'V' or Chinese letter pattern along with bluish black metachromatic granules at the poles seen. Fungi are very difficult to visualize without the aid of special Staining procedure. Lactic acid act as a preservative for fungi. The phenol portion kills the fungi. The cotton blue stains the fungal elements that results Fungal elements are stained a deep blue; background is pale blue. Do not overstain. Bacterial flagella are fine, thread like organelles for locomotion. They are slender (about 10 to 30nm in diameter) and can only be seen directly using the electron microscope. In order to observe them with the light microscope, the thickness of the flagella are increased by coating them with mordants like tannic acid and potassium alum, and staining them with basic fuchsin (Gray method), pararosaniline (Leifson method), silver nitrate (West method) or crystal violet (Difco's method). Although flagella staining procedures are difficult to carry out, they often provide information about the presence and location of flagella, which is of great value in bacterial identification. Many bacteria have a slimy layer surrounding them,which is usually referred to as a capsule. The capsule's composition, as well as its thickness, varies with individual bacterial species. Polysaccharides, polypeptides, and glycoproteins have all been found in capsules. Often, a pathogenic bacterium with a thick capsule will be more virulent than a strain with little or no capsule since the capsule protects the bacterium against the phagocytic activity of the host's phagocytic cells. The capsule stain is of some importance in clinical microbiology (e.g., in the diagnosis of bacterial pneumonia and the fungus Cryptococcus neoformans) Anthony's procedure employs two reagents. The primary stain is crystal violet, which gives the bacterial cell and its capsular material a dark purple color.Unlike the cell, the capsule is nonionic and the primary stain cannot adhere. Copper sulfate is the decolorizing agent. It removes excess primary stain as well as color from the capsule. At the same time, the copper sulfate acts as a counterstain by being absorbed into the capsule and turning it a light blue. In this procedure, smears should not be heat-fixed since shrinkage is likely to occur and create a clear zone around the bacterium, which can be mistaken for a capsule. The acid-fast stain is a laboratory test that determines if a sample of tissue, blood, or other body substance is infected with the bacteria that causes tuberculosis. The lipoid capsule of the acid – fast organism takes up carbolfuchsin and resists decolorization with a dilute acid rinse. The lipoid capsule of the mycobacteria is of such high molecular weight that is waxy at room temperatureand successful penetration by the aqueous based staining solutions (such as gram’s) is prevented . The rapid plasma reagin (RPR) refers to a type of rapid diagnostic test that looks for non-specific antibodies in the blood of the patient that may indicate that the organism (Treponema pallidum) that causes syphilis is present. The term "reagin" means that this test does not look for antibodies against the actual bacterium, but rather for antibodies against substances released by cells when they are damaged by T. pallidum.In addition to screening for syphilis, an RPR level (also called a "titer") can be used to track the progress of the disease over time and its response to therapy. A white blood cell count estimate the total number of white cells in a cubic millimeter (mm3) of blood. It is important in the diagnosis of disease especially when accompanied by a differential white cell count. The Hemagglutination assay is a method for tittering influenza viruses based on their ability to attach to molecules present on the surface of red blood cells. A viral suspension may agglutinate the red blood cells, thus preventing them from settling out of suspension. By serially diluting a virus in a 96-well plate and adding a consistent amount of red blood cells, an estimation of the amount of virus present can be made. ASO latex test is based on principle of agglutination. When latex reagent (Polystyrene Latex particles coated with Streptolysin O) is mixed with a test serum containing antibodies to streptolysin-O higher than 200IU/ml gives visible agglutination reaction. If the concentration of ASO is lesser than 200IU/ml, no agglutination will be observed. Enteric fever specific agglutinins (antibodies) are detected in patients after 15 days of fever. BCG vaccinated patient's serum may show elevated titre of all three 'H' agglutinins. Stained salmonella antigens are used to detect and identify specific antibodies in serum samples from patients suffering from enteric fever.Bacterial suspension which carry antigen will agglutinate on exposure to antibodies to salmonella organisms. Amboceptor gets its name from the Latin root “ambi-“, because it’s a receptor for two things. An amboceptor is something that attaches to an antigen, and then attaches to complement molecules. When this happens on a cell surface, the complement pokes holes in the cell to damage it. When it happens in solution, it blocks the complement from attaching to cell. Serotyping is a definitive typing method used for epidemiological characterization of bacteria. Serotyping depends on testing the organism reaction with many different antibodies to determine which antigens are present. Based on detection of antigens a single species can be divided into hundreds of thousands of different serotypes. This is a quick and easy technique, which provides much useful data. whole cell agglutination is used widely as a diagnostic tool, forexample with the fish pathogenic streptococci and Edwardsiella tarda. This pregnancy test kit contains everything you need to simply and accurately find out wheather your sample contains hCG antigen. Put 3-4 drops of urine(sample collected from pregnant women) in the sample well of the Slide and wait for five (5)minutes. The test result in the form of red to magenta (reddish purple) lines or bars will appear in the Result Area of the slidewhere antibodies are coated. Slide test for pregnancy utilizes the principle of latex agglutination inhibition. The urine specimen to be tested is first mixed with the antibody reagent containing antibodies directed against the beta subunit of hCG. Then hCG coupled latex reagent is added and the mixture is allowed to react. When the urine specimen is from a non-pregnant woman and does not contain hCG, the anti-beta hCG monoclonal antibodies will be free to react with latex coupled hCG causing agglutination. When the urine is from a pregnant woman and contains at least 0.3 IU/ml of hCG, the anti-beta hCG monoclonal antibodies will be neutralized and will not react with the latex coupled hCG antigen. Hence no agglutination will be observed. The venereal disease research laboratory (VDRL) test is designed to assess whether or not you have syphilis, a transmitted infection. Instead of testing for the bacteria that causes syphilis, the VDRL test checks for antibodies to this bacteria. Immune system produces a specific kind of antibody (a type of protein) when it defends body from syphilis. Measurement of D-glucose is extremely important in biochemistry and clinical analysis, as well as in food analysis; it is mostly determined along with other carbohydrates.The amount of NADPH formed through the combined action of hexokinase (HK) and glucose-6-P dehydrogenase (G6PDH), measured at 340 nm, is stoichiometric with the amount of D-glucose in sample volume. Looking for BIO TECH Teaching Kit-Immunology ?